12 Apr 2019 --- A novel postbiotic ingredient has made its entry in the nutrition and beauty markets, with the launch of Sabinsa’s LactoSporin cosmeceutical ingredient. 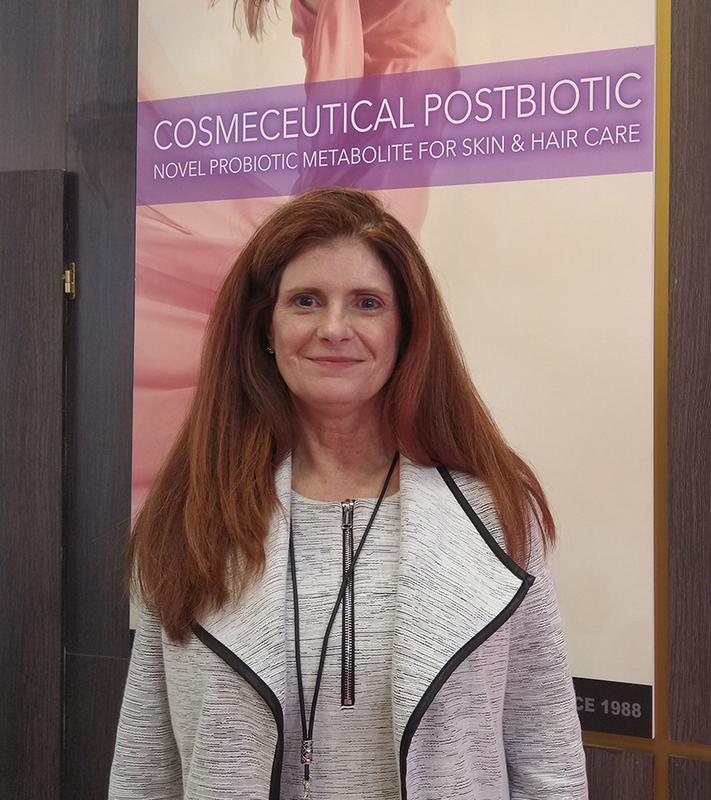 The “beauty from within space” holds particular interest for the company, Natalie Martinez, Head of Sales, Cosmetics – Americas, Sabinsa, told NutritionInsight at In-cosmetics Global 2019 in Paris. Sabinsa’s newest addition is a non-living microbial cell product that touts anti-aging and hair growth properties, as well as suitability for diverse applications. Postbiotics are pegged by experts as “the bacterial products or metabolic byproducts from gut microbes that have biologic activity in our bodies” and are a new exciting area for R&D. Cosmeceutical ingredients is a trending category in which Sabinsa sees increased growth potential and due to their ability to decrease inflammation and help maintain intestinal homeostasis, postbiotics may be a smart alternative to the use of whole bacteria in probiotic form. LactoSporin’s properties range from preventing skin aging and promoting hair growth to antimicrobial, antioxidant and anti-inflammatory properties. It may also protect against UV radiation, environmental pollutants and prevent microbial biofilm formation, according to the company. Moreover, the ingredient is water-soluble and stable in acidic conditions while being gentle to the eyes and skin. Click to EnlargeNatalie Martinez, Head of Sales, Cosmetics – Americas, SabinsaLactoSporin is purified from the culture supernatant of the probiotic strain B. coagulans MTCC 5856 (LactoSpore) by a patented process, with the International Nomenclature Cosmetic Ingredient (INCI) name Bacillus Ferment Filtrate Extract. Ingestible ingredients are increasingly gaining popularity in the cosmeceutical space, according to Martinez. “I think we are going to start seeing companies, especially those that are in multi-industries, become more active in this space, as well as [covering] the nutritional aspect,” she says. Sabinsa’s in vitro studies have shown that LactoSporin is highly active against significant skin pathogens such as acne-causing bacterium Propionibacterium acne. “LactoSporin is one of our new products and our next step is human study, as we have concluded all the in vitro studies,” she notes. “In tackling acne, you can work with an ingestible ingredient that helps with the immune system, since there are many aspects in the development of acne, as well as having a topical ingredient that is working in combination [with the ingestible ingredient],” Martinez explains. “I think that we are going to be seeing more trends in ‘working from within.’ Some countries have already been doing this quite well. In the US market, we are a little behind with beauty from within, but the interest is growing,” Martinez notes. Martinez also highlights the strong potential probiotics have within this space and how it may prove an interesting area of research. Martinez adds that given Sabinsa’s expertise in nutritional ingredients the move to personal care is bound to be a smooth one. Consumers are definitely asking for traceability and sustainability, according to Martinez. Consumers are also no longer satisfied with a branded product. The attention is now also centered around branded ingredients, that boast the expertise of well-known industry players. “The natural ingredients space is growing. And what is important with Sabinsa’s ingredients is that we standardize them so that our natural ingredients are always the same,” Martinez explains. Depending on the formulations, of course, there could be a number of challenges in product development, she notes. However, if there is an issue in formulating with a certain ingredient, the company is quick to support its customers. “At Sabinsa we have a wide range of scientists and we can connect our customers with our R&D team to really help them through with any issues they may be having regarding formulations,” she explains. Beyond the cosmeceutical space, Sabinsa’s latest accolades include being awarded a US, Japanese and Australian patent for its ForsLean ingredient. The ingredient’s original patents defined its use in promoting lean body mass, reduction of adipose tissue (fat) and weight loss. The new patents focus on another use of ForsLean, the conversion of white fat to brown fat – which produces heat and burns calories, therefore, leading to weight loss. This way the ingredient may help prevent the development of obesity and metabolic diseases.